When I first got my placement and was scouring the Web for information on my town and my school, I accidentally hit on some info about 〇〇 West High School, instead. When written in kanji, there's just a single character difference between them. In fact, quite a lot of the English info you'll find is related to West High School - a well-known rock band's members graduated together from there. Even my JTE taught them, some fifteen years ago. 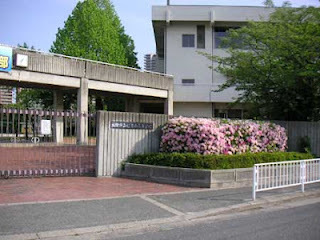 But, even though it was a relatively new school - built in the seventies, when my own school was built in 1966 - with beautiful grounds, it closed before I arrived in Japan. 〇〇 N High School, where Emily taught, was opened as a replacement. It was a really nice looking school, and quite nearby to my place. Probably, Emily would have been placed there if it was still open. It made me a bit sad that it was gone even though I'd never been there. I'm crazy like that - love anything retro; old buildings, etc. One day I even bicycled out to 〇〇 West to take a look - but it was kind of depressing. The building was in decent condition but neglect had definitely taken its toll on the grounds. This gate area especially, which I recalled from the website, looked particularly lonely. In the almost-completely-gone sun it was overgrown and rust was trailing from the school sign. The flowers were dead, from neglect or the fast-approaching autumn. Barbed wire topped the cement fence and just inside, the paint on the white bicycle racks was rusted and peeling. Pylons were scattered around. It was just really sad; the place had obviously been well cared for and looked well-kept not so long ago. Now it was just waiting to be torn down and everything was locked down and barbed up to keep out the miscreants (and myself). I wanted to go inside, just within the grounds, but didn't dare do so alone. "Don't waste West High School!" From then on, hearing anything about 〇〇 West caught my eye. I was thrilled when, after teaching a volunteer class at Emily's school, I was given a 〇〇 N High School hand towel with the names and mascots of the two schools that had amalgamated into it when it opened, including 〇〇 West. Probably, somewhere at 〇〇 N, I could have seen the old uniforms and trophies and yearbooks in a display case, if I'd thought to ask Emily about it. Not sure why I never did. The most frequent reminder was the graffiti. It's pretty rare out in the suburbs, though it does exist. 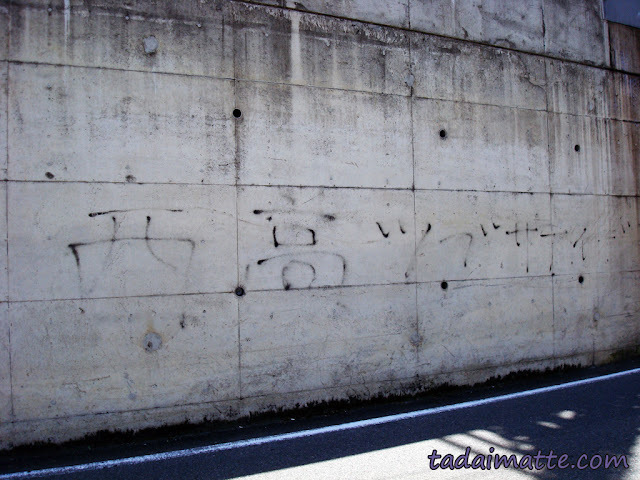 On my usual bicycle route to school, along the train tracks, there was some graffiti written in spray paint on the concrete wall. The first part was katakana too stylistic to read, but the second part said West High School. I kept meaning to write down that kana combination and figure out what it said, but I never got around to asking until long after I left Japan, even though I passed it every day.